I recently went through my childhood trunk and found all my treasures. LOL One of which was a puppy dog colored with sand. I am not sure what grade I was in but I do remember making it. We drew a picture, added glue and then colored sand. It was so fun and I loved how it looked. I wanted to do it with my kids. So I started looking for ways to make my own sand. To buy already colored sand was too expensive. I have to give a shout out to some Trendy Treehouse Facebook fans (Tina & Lisa). Thanks for helping me find out what to use. They suggested Powdered Tempera and/or Powdered Pigment. Unfortunately I could only find a couple colors at Michael's. So I ended up getting Tempura Paint. I saw in another tutorial that you could do that instead of the powder. I haven't made it yet, but here are the directions anyway. I bought all the goodies yesterday and today when the kids get home we will be coloring the sand. Then this weekend we are going to have fun using it. Start with 2 cups of sand in a clean bowl. 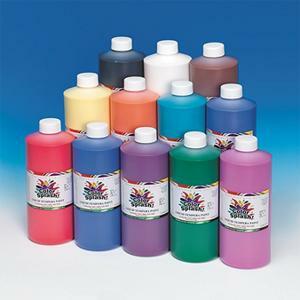 Mix in desired color of tempera paint. 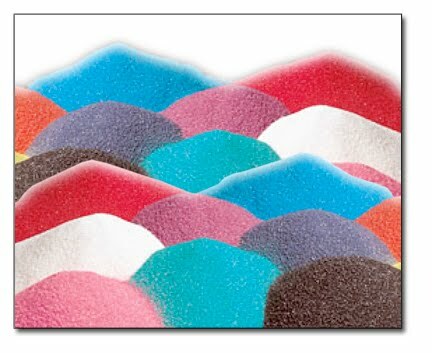 Add this in small amounts, you don't want the sand to clump up. Add water if you need to thin out the paint. But very little. 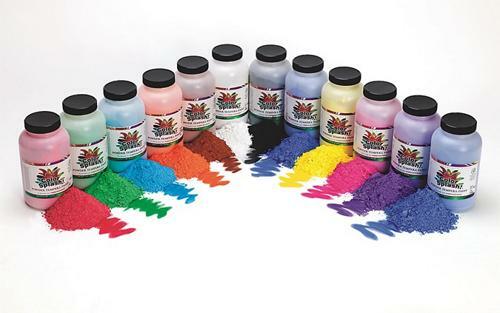 If you are using the tempera powder, mix in 1 tsp. at a time to your sand mixture. Add lil amounts of water as you mix in to get desired color. Add more powder if you don't get the right color on the first try. After your done mixing the sand and have the right color, spread your sand out on a piece of wax paper, pan or paper plates to dry. Once the sand is done drying you can transfer it into your containers with your funnel for less mess. Keep some in ready to use bottles and left over sand in easy to store containers. Have your kids draw a photo and use glue and sand to color it. Makes beautiful pieces of art. Get out a dinner tray and let your kids draw pictures with the sand. No glue. You can use one color or mix colors. Just know that mixing will cause the colors to blend and you will not be able to add back to the solid colors. But take this opportunity to teach your kids how to mix colors. Mix colors together to make new colors. Make a color chart by gluing sand in color circles. A great pre-K project. Treasure Sand Box - Get a container and add in some of your colored sand as well as prizes. It can be a good behavior prize box. It makes getting a prize fun. Digging for a cool prize. Add layers of sand in a bottle to make a beautiful sand masterpiece. Remember making these at the fair? I do. It was so fun! I made a pink flamingo with google eyes and a big pink feather. Loved it. Make it a game - In two containers add sand and like the prize box, add in items. Make sure they are the same in each box. Give your kids a list of the items and let them go hunting. First one to find all the items gets a prize. Look and find - take a plastic bottle and add in sand and items. Glue the top closed. Your kids can roll it around and find all the items inside. Give them a checklist so they can mark off what they have found. A great car game too! I know there is a lot more I could mention, but have fun with it and please share your sand ideas with us too! I wish I could find mine to show you a picture of. I put it in a safe place and you know how that goes. LOL When I find it I will add it to this post. Pictures thanks to Google Images!